Digital Cyber Cherries has just taken the wraps off its first official game release, and shares exclusive details with Shacknews on its co-op mode, environmental hazards, and more. Digital Cyber Cherries, the U.K. studio behind the ambitious NewRetroArcade, recently took the wraps off its first official game. 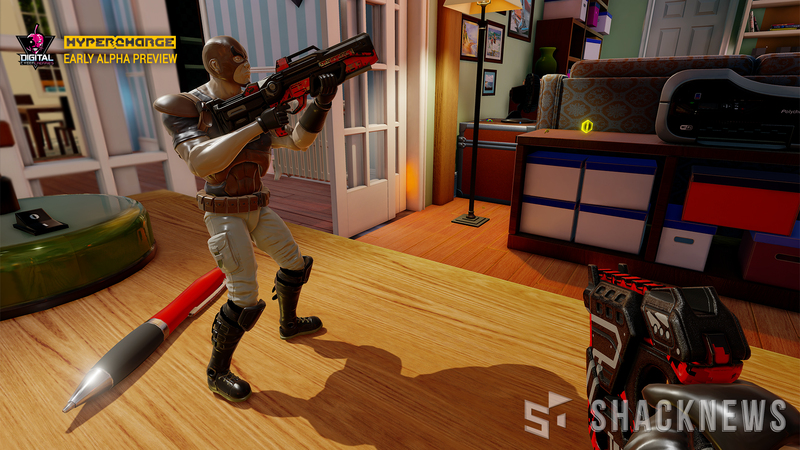 Hypercharge, a hybrid third-and-first-person shooter inspired by 80s action figures like G.I. Joe and He-Man, is targeted directly at your nostalgia. Shacknews spoke with DCC community manager Joe Henson for exclusive details on its co-op mode, environmental hazards, and more. Though currently in alpha, Hypercharge looks quite polished after 14 months of development. Most of what DCC debuted implies the competitive angle, but the studio is currently working on shoring up its cooperative offerings. Henson said the PvP came first, in order to get all the systems up-and-running, but they're putting a major emphasis now on developing the co-op. That will pit your team of action figures against A.I. 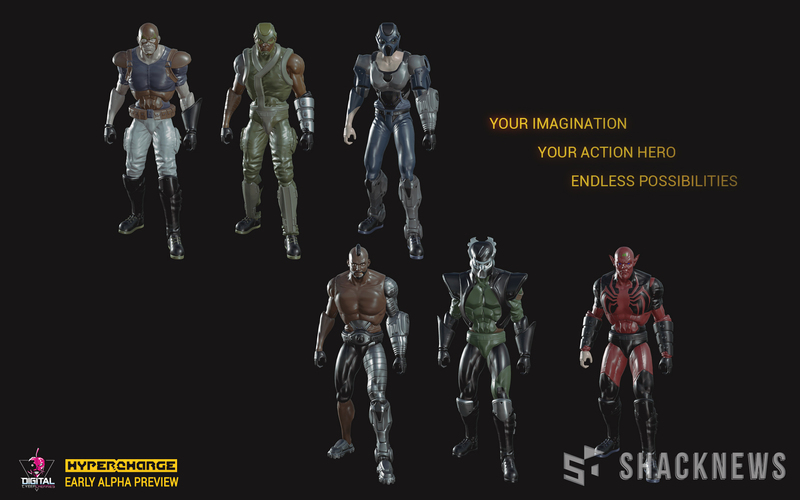 opponents like hordes of aliens or androids, or mutated action figures that swarm akin to zombies. Matches will mix up the standard combat with environmental hazards that DCC calls its "Dynamic Dangers" system. "That’s basically interaction with the environment, things like microwaves or mousetraps," Henson said. "If you’re fighting somebody and you push them back to a certain point in the kitchen and their only escape is the oven, you can trap them in the oven and burn them. This is part of the reason we wanted the scale of action figures. Because everywhere you go, something is a danger or something you can use to your advantage. When we’re testing this, each game is so different." And to that end, the environments are modeled after regular little pieces of suburbia. To build an environment, Henson says the team might make an entire house, and then cut it into individual sections to make different maps. "You won't be playing in a huge house because it's just too big," he said. "A living room and dining room, that's the right size." To traverse these large chunks of the map, DCC is developing vehicles for your action figures to hop into. 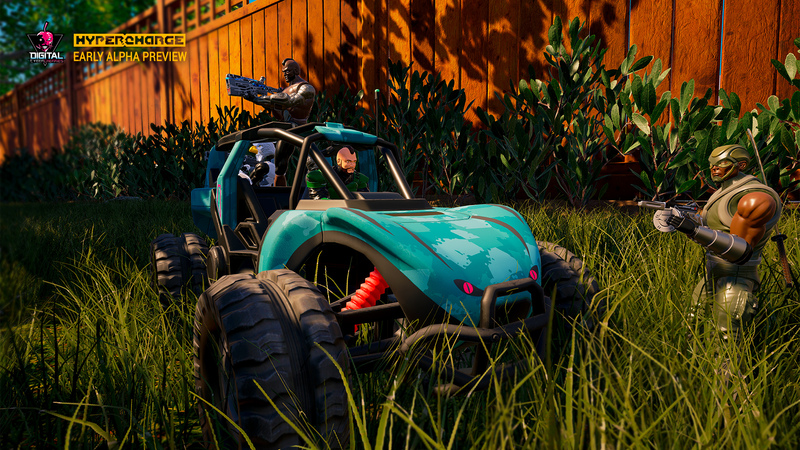 The buggy, for example, has space for two passengers to support the co-op mode. A big part of the appeal is meant to be the level of customization for your figures. The creation tool lets you get incremental enough to change features like your fingers or wrists. With all that customization, downloadable content seems like a given. But, while DCC is still deciding whether to do microtransactions at all, Henson says the team is committed to keeping them cosmetic-only. Henson was adamant that the team is opposed to anything that impacts stats, which he calls "pay-to-win." "I’m that confident, that I will hold a Shacknews sign above my head saying 'I lied, Shacknews,'" he said, "and I will walk around my city center wearing a bright pink wetsuit while being pelted with dung." Preferably, we won't have to hold him to that. Hypercharge does not have a release date set, but plans to launch on PC and Xbox One. Anyone remember Re-Volt, the toy car racing game? This gives me the same kind of vibe. Looks kinda cool. Haha, "wearing a bright pink wetsuit while being pelted with dung." Brilliant.